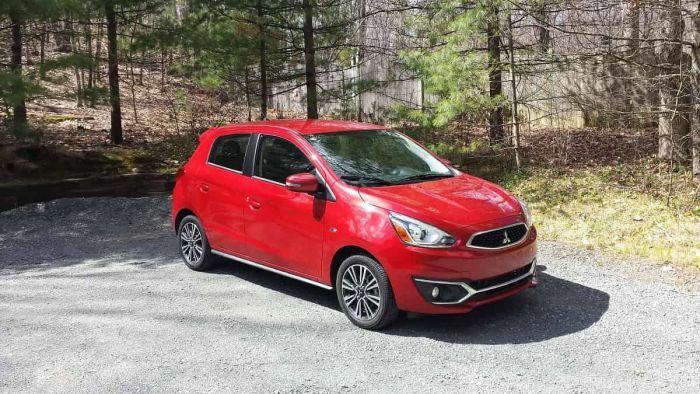 The 2018 Mitsubishi Mirage GT is one of the best-equipped cars for the money, not just for sale today, but in all of human history. When I bought my first new vehicle, I was just out of college and digging holes for a living. My mechanical engineering degree was hard to shop around in the economic downturn. I would eventually land my first job in my field, but for the first six months after graduating starting my own landscape business was a definite option. Moonlighting to earn extra cash cutting lawns and doing cleanups was a necessity, so I looked for the cheapest small truck I could find. It turned out to be a 1990 Mitsubishi Mighty Max. My memory of the price was that the local dealer was running a special. $6,999 with zero options. I bought that truck with no credit. The dealer actually asked for a photocopy of my diploma and a note from my employer that I was gainfully employed. I loved that truck, but when I say it was bare bones I mean it. Here is a quick rundown on some of the things a new owner of a zero-option 2018 Mitsubishi Mirage GT, priced at $16,595 before destination charges, will enjoy that my first Mitsubishi didn’t include. My Mighty Max didn’t just have no radio, it had no antenna and no speakers. The Mirage GT has both AM and FM radio, plus a Bluetooth connection, so I can play whatever I want via my smartphone. Back in the day I used my high-tech Sony Walkman and wore headphones in violation of the laws of the Commonwealth. That was how we kicked distracted driving old-school. We take air conditioning for granted now, but just like the radio, my first two new vehicles didn’t have AC. The Mirage GT has this and you can’t get it any other way. My Mighty Max did have locks, but they required that the key be put in the lock and turned. It aslo had windows, but they rolled up and down via my left bicep. My Mighty Max almost went over on the highway once on the way to a Depeche Mode concert. Stability control was not yet a thing. I’m not really a fan of alloy wheels on trucks in general, but a little bling would have been welcome. When I owned my Mighty Max I didn’t own a camera and most of the people I knew didn’t own a camera. Having one in the truck would have been cool! I could have paid extra (if I had the money) to get an automatic transmission in my Mighty Max. If there was one just one option I could go back and add it would be that one. Commuting with a stick is not fun. My bottom was the heater for the plastic seats in my truck. It may sound crazy in today’s safety-mined world, but my Mighty Max didn’t come with a rear bumper. After I bought the truck, I had one added by the dealer. It immediately rusted. The dealer was very helpful and replaced it at no charge. It immediately rusted. The rear bumper of the Mirage GT is non-ferrous. Progress!